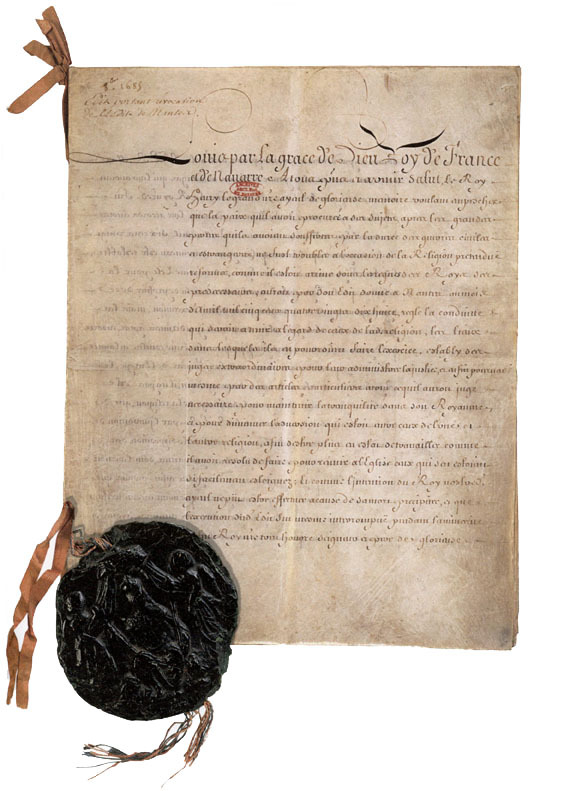 While the Huguenots were never completely equal with Catholics in 17th-century France, the Edict of Nantes did accord them substantial civil rights. Those rights, however, were at the whim of the King, and when Louis XIV began to see religious pluralism as an impediment to the centralization of his power as an autocrat, the die was cast. 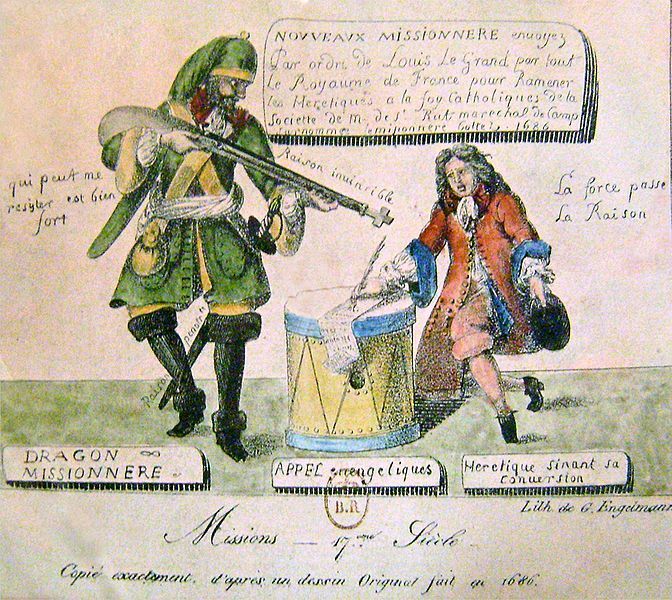 Beginning in 1681, Louis began a campaign of intimidation against the Huguenots. Called “Les dragonnades,” the campaign forced Huguenot families to billet (or quarter in their homes) rowdy dragoons from the French Army. In essence, the dragoons were used as a domestic “security detail” to terrorize Huguenot families and thereby pressure them to convert or emigrate. This practice caused outrage in neighboring Protestant England, to which many Huguenots emigrated during those years. A copy of a Protestant engraving satirizing the dragonnades under Louis XIV, by Godefroy Engelmann (1686). International Museum of the Reformation, Geneva. In 1685, spurred on by his advisors and possibly by his second wife Françoise d’Aubigné, a former Huguenot and devout Catholic, Louis issued the Edict of Fontainebleau, ending the short French experiment with religious toleration. The practical and almost immediate effect was that the existing trickle of Protestant emigration became a veritable exodus. Huguenots fled to neighboring England, Switzerland, the Dutch Republic, Denmark, Sweden, Brandenburg-Prussia, and Protestant states in the Holy Roman Empire, as well as to such far-flung destinations as the Dutch Cape Colony in what is now South Africa and England’s colonies in North America. Louis himself bragged that of the 800,000 to 900,000 Huguenots in France in 1685, only a thousand remained in 1686. This is certainly a self-serving exaggeration, but the Edict was responsible for a “brain drain,” in which at least half of France’s highly-skilled Huguenot population fled the country. The stringency of anti-Protestant policies varied in the years following the Edict, but it was not until Louis XVI signed the Edict of Versailles in 1787 (ratified in 1788) that state-sanctioned religious persecution ended in France. A personal aside: This is an interesting story for me because, as you might already know, one of my first ancestors born on American soil was the son of two Huguenot immigrants to the Carolina colony: Isaac Dubosc (transcribed as “Dubose”) and Susanne Couillandeau. They arrived in Charles Towne some time between 1685 and 1687 and formed part of a historically important Huguenot community in that nascent English colony. You can read more about that in this article. A list of Huguenot settlers at Santee in the Carolina colony. 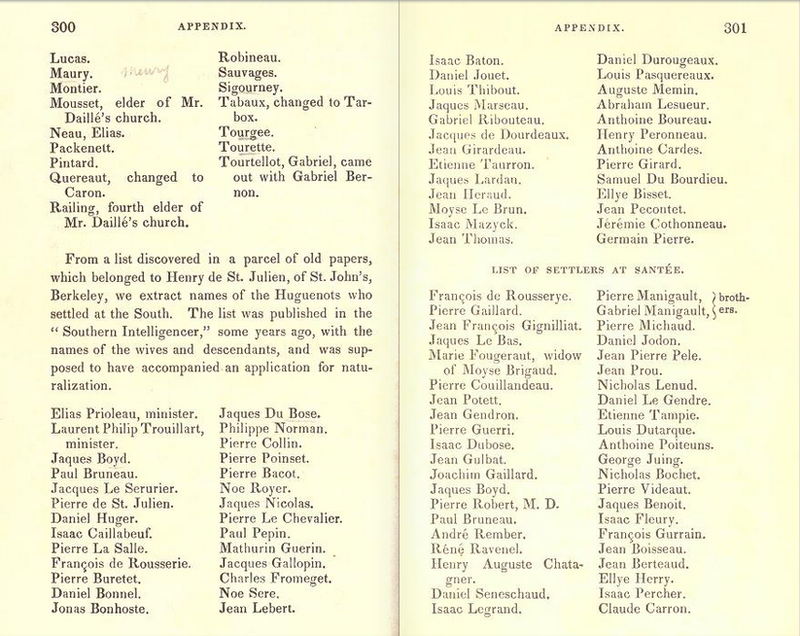 In the first column you can see my 7th great-grandfather, Isaac Dubose, and my 8th great-grandmother (his mother-in-law), Marie Fougeraut, and her son, Isaac’s brother-in-law, Pierre Couillandeau. Source: Lee, Hannah Farnham Sawyer. The Huguenots in France and America. Cambridge: John Owen, 1843.